This page will include what we can find out about the Indians who lived in the area. descendants of the group are known today. south into Florida near the present town ofMicanopy in Alachua County. There they became known as the Seminoles. near Tallahassee, and along the Apalachicola. tably find release in war. toward the Spanish for a time, at least. The original people of Florida included the Timucia, Apalachee and Calusa Indians. They were absorbed by the Seminoles, who were mostly Lower Creeks from Georgia and Hitchiti who came to Florida in the early 18th century when it was Spanish territory. They were joined by other refugee Indians and escaped slaves. The Seminoles occupied land in northern Florida that was coveted by American settlers in Georgia. This and the fact that they were known for harboring fugitive slaves became cause for dissention. The U.S. was fighting the war of 1812 with the British. Andrew Jackson was sent to seize the Florida territory from Spain and he destroyed several Indian settlements before capturing Pensacola in May 1818. In 1819 Florida became a U.S. territory and colonists began moving in to nothern Florida and forcing the Indians to the south where the regions were unsuitable to their agriculture. In 1823 the Indians ceded most to their tribal lands to the U.S. and in 1832 the treaty of " Paynes Land" bound them to move to territory west of the Mississippi. Andrew Jackson started a policy of Indian removal. 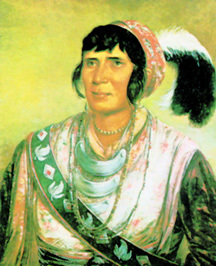 The Indians resistance resulted in the Seminole wars. After the capture of Osceola in 1837, and the end of the 2nd Seminole war in 1842 many of the Indians were forced west to Indian Territory (now Oklahoma). After the third Seminole war another 250 were removed and a peace treaty was signed in 1935 with the remaining Indians. In 1962 the Mikasuki acquired ownership of their lands in the Everglades. The Florida Seminole have five reservations.